Has your adolescent moved on from middle school to high school? They may have looked forward to moving up a grade with their friends, but they may have also found the transition somewhat daunting and stressful. If some of your teen’s friends from middle school are attending the same high school, this will have made the move easier. However, there will still be a host of students they don’t know, a new school culture, more challenging classes and new social pressures – it’s a lot to cope with. So, here are eight tips on helping new high-schoolers navigate this milestone in their life. Your teen needs a quiet spot without the distractions of phones, TV, loud music, and video games. While they may claim to be an expert multitasker, able to do homework while also checking their Facebook account, studies show that multitasking is not beneficial to studying. Setting up a regular time to do homework also helps. Encourage them to establish a daily homework agenda. Homework assignments, extracurricular activities and upcoming test dates may be available online so they can look ahead and plan more effectively. If the high school workload is heavy, teach your teen to prioritize and do the most pressing or difficult homework first. This way, if everything doesn’t get finished, the most important assignments will have been completed. Many high schools post grades online, making it easy to go over grades and assignments every week. Praise should come first as your teen needs to know that you are proud of their successful efforts. After the praise, you can turn the discussion to any missing or late work and what can be done to improve. Sometimes a large project may seem overwhelming especially if your teen is not organized and has trouble focusing. Teach them how to break the assignment down into more manageable pieces. You might begin with a brainstorming session one day, doing research the following day, writing a section the next day, and so on. The aim is to make the project seem much more doable. 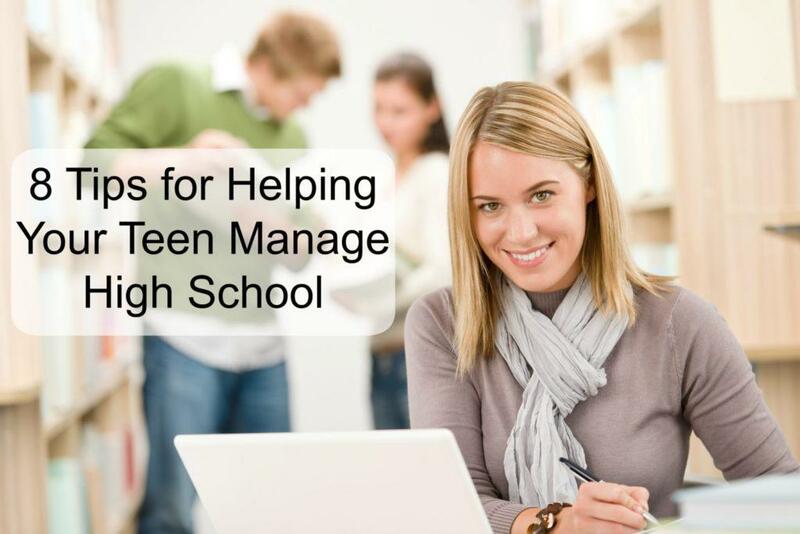 Your high schooler can keep an itemized list of the various steps and check each step off as it gets completed. Each time they put a tick next to a completed item, they will feel a sense of accomplishment and be less stressed about an impending deadline. Forethought and focus aren’t always adolescent strong suits. Lack of preparation usually leads to disorganized mornings and rushing out the door to catch the school bus on time. More preparation the night before will mean less stress and more time for breakfast the following morning. Before going to bed, encourage thinking ahead. This could include laying out school clothes, packing up homework, and collecting musical instruments and sports equipment in one place. Remember that it can take many repetitions to turn actions into habits. It’s not helpful to nag or roll your eyes at their forgetfulness; it will just make them defensive. Try to help your teen understand that the point of working hard in high school isn’t just to get good grades. It’s also about building towards a happy, fulfilling future. Encourage them to indulge in visions about their future and talk about the educational steps necessary to achieve their goals. Whatever you do, don’t discourage them by shooting down their dreams. Your student should also be encouraged to try different interests on for size. Does your teen tell you that they hate school? Just as it’s not a good idea to do their homework for them, it’s best not to immediately supply solutions to any school problems they may be having. Instead, encourage them to think through the issues themselves by asking them what they think caused the problem, what they’ve done so far to deal with it, and what they plan to do next. Failing at something is a necessary part of growing up. You can help your teen to handle failure by talking about your own past struggles and helping them to understand that even when things go badly, there are always other options and new opportunities to improve. Although your sympathy is important, don’t insulate them from all consequences. Teens who are protected from all the pain and anguish of failure are likely to react badly to misfortunes later in life. Many mental, emotional and physical challenges surface during the high school years. Addressing them when they first appear avoids being overwhelmed by them later when teens may not be able to fulfill educational goals. Many high schoolers with challenges can be helped and go on to become successful throughout high school, college and beyond. If you need professional guidance, Doorways is here for you. We want your teen to be successful, so make a no-cost, no-obligation appointment with us today.